Lonnie Pacelli, a globally-recognized project management authority, is the creator of the Six-Word Lessons series, which began with this book, based on the legend that Ernest Hemingway was challenged to write a story in only six words. The story was: For sale: baby shoes, never worn. 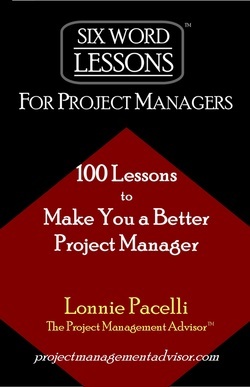 Lonnie took this idea to heart and wrote a book about his project management expertise with 100 six-word lesson titles and a brief description for each lesson. He thought this Six-Word Lesson format would be perfect to give project managers a quick, simple reference to make them better at their jobs, and generate successful project results. Read a review on Six-Word Lessons for Project Managers. Sponsors and Stakeholders, Friend or Foe? Training: Why Don't You Get It? Adoption: Why Don't They Use It? Each six-word lesson gives you a concise explanation how a project can go south when the lesson is not followed along with how to apply the lesson to your day-to-day world as a project manager. Years of wisdom in a book you can read in an hour!